Replay the webcast of the 11th Annual San Antonio Blessing of the Peacemakers when Dr.Rajam Ramamurthy was named 2017 Peace Laureate at the Whitley Center of the Oblate School of Theology. 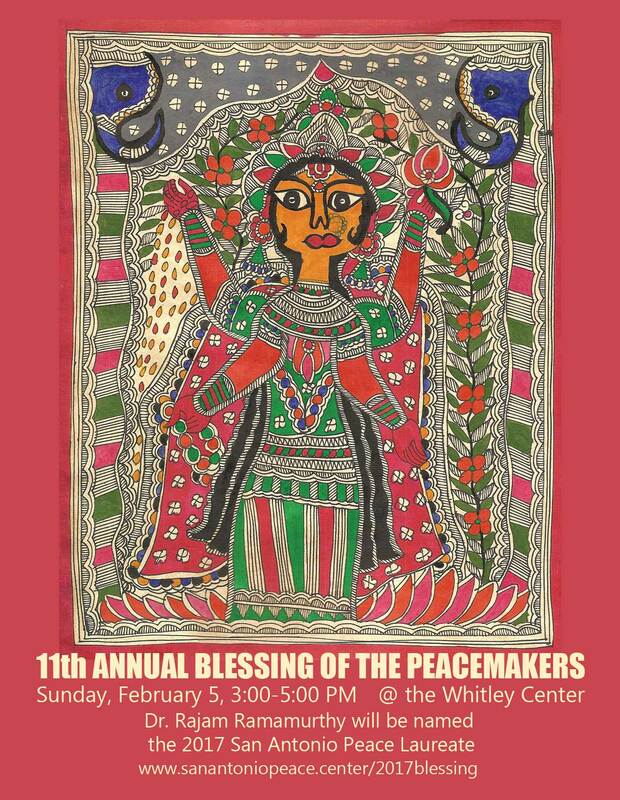 Since 2006, the peaceCENTER has celebrated The Blessing of the Peacemakers, a joyous hour-long interfaith ceremony featuring music, prayer, new inclusive and innovative rituals and inspirational speakers. It is the first event marking the beginning of the 64-day Season for Nonviolence and honors all of the peacemakers in the city. It is typically held on the last Sunday in January. Thanks to donations from viewers like you, anyone can watch The 2017 Blessing of the Peacemakers for free on this site. 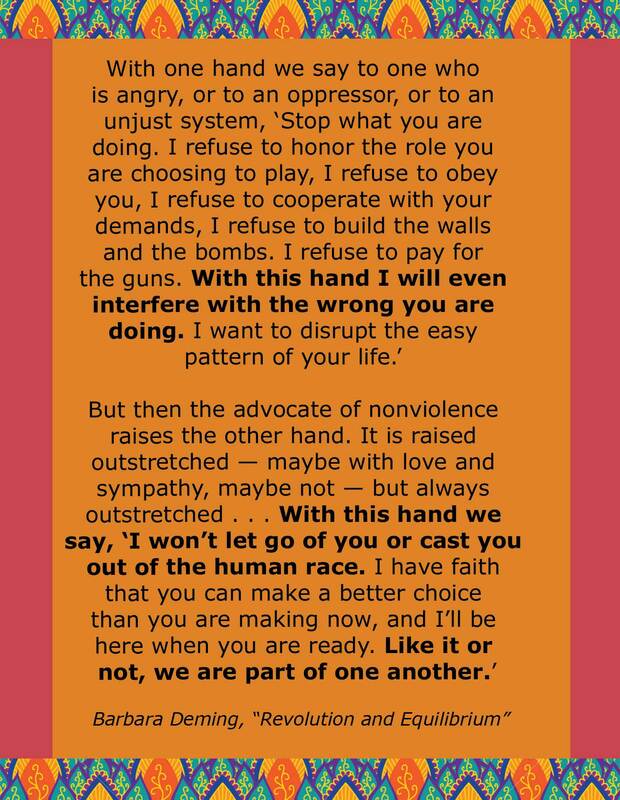 The national Season for Nonviolence, Jan. 30 through April 4, is a 64-day educational, media, and grassroots campaign that demonstrates that nonviolence is a powerful way to heal, transform, and empower our lives and our communities. Inspired in 1998 by the 50th and 30th memorial anniversaries of the assassinations of Mahatma Gandhi and Dr. Martin Luther King, Jr., this international event honors their vision for an empowered, nonviolent world. It has been endorsed by such notables as the Dalai Lama and the late Coretta Scott King. During the Blessing of the Peacemakers, since 2008, the peaceCENTER has announced and appointed the San Antonio Peace Laureate: a local a voice of wisdom and experience to speak for peace and justice in San Antonio. 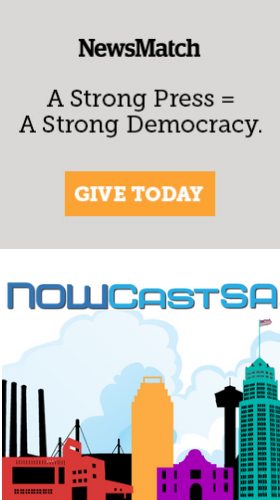 The idea for a San Antonio Peace Laureate arose at “Soul of a Citizen,” a city-wide conversation about the intersection of faith and politics held at the San Fernando AT&T Community Centre on November 14, 2007, hosted by the peaceCENTER, Fr. David Garcia of the Cathedral and Bexar County Judge Nelson Wolff. The peaceCENTER took on the project to honor a voice of wisdom and experience to speak for peace and justice in San Antonio. The laureate was announced at the annual Blessing of the Peacemakers on January 27, 2008, the inaugural event of the annual Season for Nonviolence and serves for a year, until the next Blessing.